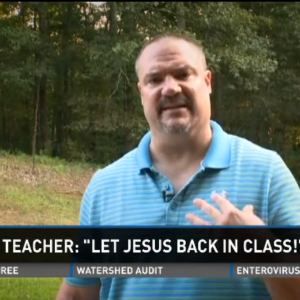 CANTON, Ga. — A history teacher in Georgia has taken leave from his classroom over his frustration that he may not speak about God in school. John Osborne of Sequoyah High School in Canton says that he is using his time off to consider whether or not he will return to class as he does not feel supported by administrators. He states that he has spoken about Christianity in the classroom for years, but was recently the target of a complaint. “I teach world history, so there is a lot of talk about religion, and really all I want is equality to talk about everything in America, including Christianity,” he told WGCL-TV in Atlanta. Osborne said that he was accused of telling students that they would go to Hell for smoking pot, but he denies the allegations. He states that he only seeks to be a positive influence on students to help them to live honorable lives. On Tuesday, hundreds of students rallied together for Osborne, assuming that he had been put on leave by the school. They also took to social media to express their support for the teacher. Some students were given slips to report to detention after they were late for class due to the rally. The Cherokee County School District released a statement about the matter to reporters this week. The district also affirmed that Osborne took leave on his own, and has not been fired by the district. As Osborne considers whether or not to return to class, he said that he will not stop speaking about Christianity in the classroom as it is an extension of his character. “I do have the right to fight for what I believe in and talk about Jesus in the classroom,” Osborne stated. As previously reported, the first textbook used in the American colonies even before the nation’s founding, The New England Primer, was largely focused on the Scriptures, and was stated to be popular in colonial schools for at least one hundred years. It used mostly the King James Bible as reference, and spoke much about sin, salvation and proper behavior.